Mostly the germs enter our body through our throat and nose. Mucus membrane is lined up with number of blood vessels. When the blood vessels expand there is a swelling in the mucus membrane which ultimately results into the nasal congestion. Usually infection of ear can be the ultimate result of the nasal congestion. Varieties of causes are there for nasal obstruction. The condition of nasal blockage varies in a wide range from mild annoyance to a life threatening condition. Especially in the infants the condition of nasal obstruction may be life threatening. It affects the hearing, speech development and the ears. 1. Nasal congestion can easily be cured with the help of garlic and tomato soup. For the preparation of this soup you have to take 2-3 tomatoes which are to be boiled in a cup of water. Add a tea spoon of the paste of garlic, black pepper powder and pepper. This soup gives a great relief from the nasal blockage. It is very effective home remedy for nasal obstruction. 2. Apple extract of vinegar fume is also very useful for the purpose of inhaling. 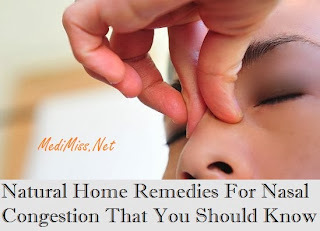 It is very effective in treating the problem of nasal congestion. For this purpose you have to take 2-3 tablespoon of vinegar in a pan and allow it to heat until the entire vinegar is exhausted and you can inhale the fume which is produced by this vinegar. It is also an effective remedy for the treatment of nasal blockage. 3. Person suffering from nasal congestion are advised to breathe in smoke produced by burning 4-5 seeds on hot coal. It is a useful remedy and is practiced by many of us especially children suffering from nasal blockage. 4. Take 1-2 teaspoon of grated horseradish. Mix a tea spoon of honey or apple vinegar. Take a long breathe by taking this mixture slowly on your tongue. This remedy will provide fast relief from the problem of nasal obstruction as the aroma of this mixture will compel to lose the congestion.